A ruthless mercenary renounces violence after learning his soul is bound for hell. When a young girl is kidnapped and her family slain by a sorcerer's murderous cult, he is forced to fight and seek his redemption slaying evil. Newish to Watch at Home: Crimson Peak, Trumbo, Grandma, Etc. In thirteenth century England, a Knights Templar and few of the Barons men, fight to defend Rochester Castle against the tyrannical King John. A man, having fallen in love with the wrong woman, is sent by the sultan himself on a diplomatic mission to a distant land as an ambassador. Stopping at a Viking village port to restock on supplies, he finds himself unwittingly embroiled in a quest to banish a mysterious threat in a distant Viking land. During the reign of the Vikings, Kainan, a man from a far-off world, crash lands on Earth, bringing with him an alien predator known as the Moorwen. Though both man and monster are seeking revenge for violence committed against them, Kainan leads the alliance to kill the Moorwen by fusing his advanced technology with the Viking's Iron Age weaponry. A splinter group of Roman soldiers fight for their lives behind enemy lines after their legion is devastated in a guerrilla attack. Solomon Kane: [narrating] There was a time when the world was plunging into darkness. A time of witchcraft and sorcery. A time when no one stood against evil. Q: There's a scene in the movie where we see some people burning corpses and there are two guys wearing black and beaky masks. What are those? The film is one of those things that you immediately "feel" it is wrong. No known actors except old guys like Max von Sydow, who get a small role anyway, an almost unknown lead character and a lot of attitude, like the movie is taking itself really seriously. Most of this kind of movies end up as pretentious flops. Solomon Kane, however, did not. It was a reasonable movie, given the low production values and the video game like story. The thing is, the people working on it obviously made an effort. 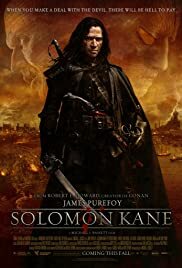 Strangely enough, it seems this sort of effort is what lacks in many films these days, even high budget ones, so this lifts Solomon Kane quite a lot. Unfortunately, the film was not great. It was, I feel, the best they could do under the circumstances, and I applaud that, though. Better than The Book of Eli, but still the same superheroy feeling. 47 of 70 people found this review helpful. Was this review helpful to you?